Nonfiction November 2017 is coming soon! 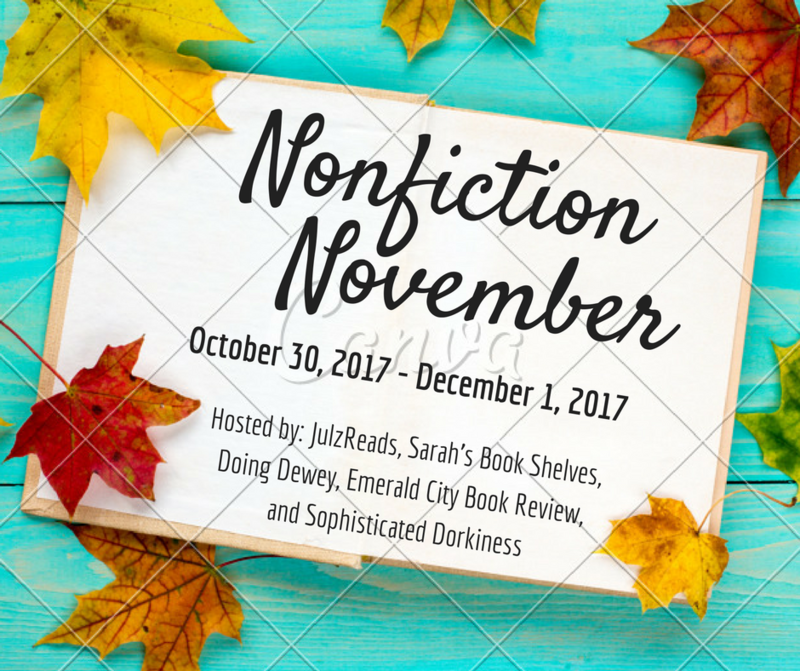 I’m thrilled to be co-hosting 2017’s Nonfiction November with Katie at Doing Dewey, Lory at Emerald City Book Review, Julie at Julz Reads, and Kim at Sophisticated Dorkiness! Nonfiction November is a month dedicated to celebrating nonfiction…we’ll talk about our favorites, trade recommendations, discuss our nonfiction reading habits, and hopefully discover some new book blogs! Personally, I tend to push nonfiction to the back burner in favor of the shiny, new fiction releases, so I always appreciate this month of re-focus on a genre I love, but tend to ignore sometimes. And, after this year of Fall fiction, I’ve been especially itching for a change of pace! Pair up a nonfiction book with a fiction title. It can be a “If you loved this book, read this!” or just two titles that you think would go well together. Maybe it’s a historical novel and you’d like to get the real history by reading a nonfiction version of the story. Three ways to join in this week! You can either share 3 or more books on a single topic that you have read and can recommend (be the expert), you can put the call out for good nonfiction on a specific topic that you have been dying to read (ask the expert), or you can create your own list of books on a topic that you’d like to read (become the expert). We’ve talked about how you pick nonfiction books in previous years, but this week I’m excited to talk about what makes a book you’ve read one of your favorites. Is the topic pretty much all that matters? Are there particular ways a story can be told or particular writing styles that you love? Do you look for a light, humorous approach or do you prefer a more serious tone? Let us know what qualities make you add a nonfiction book to your list of favorites. What are you thinking about reading for Nonfiction November? Does anyone have any thoughts on the books on my list? Which books should I kick to the top? I’m definitely going to try to participate more this year. Will there be link ups? I have one you might want too add to your list: Daring to Drive by Manal Al-sharif. It was great on audio, too! Yes – there will be weekly link-ups for each topic! AND – I’m listening to Daring to Drive on audio as we speak! Really enjoying (although maybe not the right word) it…kind of enraging. This sounds so great! Non-fiction is a genre I enjoy but definitely don’t read enough of. I hope to join you all this year! Me too – I love nonfiction, but always seem to push it aside for the latest and greatest novels! Except on audio…I’m a strictly nonfiction audiobook listener. My NF reading is still not where I would like it to be, but I’m sure that November will bring lots of potential reads to my attention. I’m looking forward to the Non-fiction/Fiction pairing. Forty Autumns and Radium Girls are on my radar already. I love the pairing…it’s my favorite theme of the event 🙂 Hope you find some great books for your TBR! “Strangers” is definitely worth a read. I should really read something by Anna Quindlen, and I love reading memoirs, so that sounds good. I adored her memoir Lots of Candles, Plenty of Cake…her outlook on life is just so rational and down to earth. I enjoyed this so much last year. And I’ve been looking forward to this year ever since! Forty Autumns is amazing! I was really affected by it. Great look at what happens to families when you build a WALL to separate them. I want to get in on this book swap business – what’s the best/easiest way to create a list? I’ve never liked November but now it’s one of my favourite months. You’re the reason I’m going to read Forty Autumns!! And you can sign up for the book swap using the Google form embedded in the post. Oh boy…I’m going to try this and hope I do better than I did last year! I love the Anne Lamott book. I’m curious about the Quindlen- I didn’t she’d written non-fiction! OMG – get Anna Quindlen’s memoir Lots of Candles, Plenty of Cake immediately! Her outlook on life is just so down to earth. I just signed up! This will be my first year joining this Book Swap. I loved looking for Nonfictions I want to read. It challenged me since I don’t normally read a ton of Nonfiction. Great to hear! And I need the push of this event to read nonfiction too!